January 14, in St. Anne's Church, by the Rev. Mr. Bredin, Mr. Charles Graham, of Enniskillen, to Sarah, youngest daughter of Mr. John Green, of Wicklow-street, Dublin. In this city, on the 14th instant, aged 9 years, Margaret Alicia, daughter of Mr. Grattan, Surgeon Dentist. She was a child possessed of great amiability and sweetness of temper, and her loss is severely felt by her sorrowing parents. Yesterday evening, aged 19, Miss Anne Rickards, second daughter of James Rickard, of this city, Esq. On yesterday morning, at 11 o'clock, Miss Mary Anne Waugh, of this city, aged 58. Few persons have departed this life of late years in Armagh whose loss will be so severely felt as that of Miss Waugh. Possessing, in a great degree, the means of doing good, she practically enforced the doctrine - "where there is much, much should be given" - and seemed to derive her greatest happiness from sharing the wealth which Providence allotted her, with the needy and the destitute; nor did her desire to do good rest with the mere exercise of her many unostentatious charities. The humble and struggling artisan, the industrious widowed mother, the child of better days, but of fortune's reverses, had but to make their wants known to her to obtain the means of relief. To all our public charities and institutions she was a most munificent contributor; and as a landlady she was kind and considerate. As a neighbour, the marks of general sympathy throughout the city attest how much she is regretted. For a length of time previous to her death, Miss Waugh endured great bodily suffering with Christian fortitude, and in her latest breath testified a lively hope of a glorious immortality through faith in the Lord Jesus. Her labours of love is now ended; but it is consoling to know that a rich reward awaits her in another and a better world, whither she has gone to prove how truly " Blessed are the dead which die in the Lord." Suddenly, in Newry, on last Monday evening, Mr. Daniel Bannon, owner of the Shamrock Steamer. The late Miss Hardiman, an aged nun of The Dominican Convent, Galway, was buried there last week without the ordinary respect or funeral service, one old friar only attending, but all the sisterhood and priests absent, because this venerable lady bequeathed 2000l. to her relatives, and not to the convent in which she died. The Rev. J. R. M'Alister gratefully acknowledges the receipt of £10 from Lord Lurgan, and £1 from J. W. Heath, Esq., towards the liquidation of the debt of the new Presbyterian Church of Armagh. Henry Echlin, Esq., has been appointed a magistrate of the County of Fermanagh. At the request of the inhabitants of Tuam [Co Galway], W. D. Freeman, Esq., Q.C., assistant-barrister, has applied for a resident stipendiary magistrate in that town. A rick of turf, the property of a respectable farmer, named Kilmartin, living at Cooragoonen, Co. Tipperary, was a few nights since maliciously set on fire. Fortunately a party of police patrolling in that neighbourhood coming up at the time succeeded in extinguishing the flames, or otherwise it would have been totally consumed. SIR, I have read a paragraph in your last number, headed as above, in which your informant has (unintentionally I am sure) led you into several errors. Among others he seems to have represented that the body of Thomas Mullin was found near the lock-pit of the Ulster canal, adjoining the river Blackwater, that no marks of violence appeared on the body--and that there is not the slightest suspicion of violence having been the cause of his untimely and mysterious death. Now, sir, the facts are, that the body was not discovered near the lock-pit, but in a field at some distance; and that I, with many others, feel that there are strong grounds, and very justifiable reasons, for the suspicion of "foul play" in this very melancholy affair. A sober and sane person, acquainted with the path, as Mullen undoubtedly was, could not, I feel confident, have mistaken his way, which lay along the margins of the rivers Blackwater and Callen--loud outcries for assistance were heard from the quarter referred to, on the night on which the deceased met with his end; also, the ground on which the body was found bore the marks of a violent struggle having taken place--the dress was much torn, and the coat partially dragged off. It is said the profile was much flattened, and the eye-balls prominent but as (strange to say) no medical man was examined on the inquest, and as none but the surgeon and the anatomist can appreciate even the exterior marks of such violence as may cause death, I do not feel justified in drawing the conclusion which will to most appear natural. I join fully and heartily with you in regret that the grand jury of the county have not taken steps to form a road through Charlemont bog, from Kineary to Charlemont--such accommodation being imperatively demanded, in consequence of the improved state of agriculture and commerce in this neighbour- hood. I, am, Sir, &c. &c. W. X. Y. Charlemont, 15th Jan. 1845. We understand that a meeting will be held in the town of Moy to-morrow, for the purpose of laying before the grand jury of this county, the necessity of presenting for a new line of road from Charlemont to Kineary. Independent of the better secu- rity for life which the carying out such a measure would con- duce to, the proposed road will open a fertile and populous dis- trict of country now insulated by the rivers Blackwater and Callen. The meeting, we hear, will be large and influential. Moses Wilson Gray, Esq., second son of John Gray, of Claremorris, in the county of Mayo, Esq. Augustine Hugh Boileau, second son of Dunbar Barton, of Fitzwilliam-square, in the city of Dublin, Esq. Henry William Lover, Esq., fourth son of William Frederick Lover of Rathmines, in the county of Dublin, Esq., deceased. Robert William Osborne, Esq., eldest son of Jonathan Osborne, of Harcourt-street, in the city of Dublin, Esq., M.D. William Annesley Mayne, eldest son of William Mayne, of Freame Mount, in the county of Monaghan, Esq., barrister-at- law. John Davis, Esq., son of Roger Greene Davis, of Drumdiah, Killieagh, in the county of Cork, Esq. George Ponder, Jun., Esq., second son of George Ponder, of Upper Temple-street, in the city of Dublin, Esq. Robert St. George Rathborne, second son of William Rath- borne, of Scribblestown, in the county of Dublin, Esq. Richard Pennefather Going, Esq., second son of Ambrose Going, of Ballyphilip, in the county of Tipperary, Esq. William Wallace Harris, Esq., fifth son of Hugh Harris, late of Ashfort, in the county of Armagh, Esq., deceased. * Edmond William O'Mahony Esq., eighth son of of Dr. O'Mahony, of Bandon, in the county of Cork, Esq. * Francis Meagher, Esq., second son of F. Meagher, late of Nenagh, in the county of Tipperary, Esq. Those marked thus (*) are Roman Catholics. Hugh Jackson--assault on Grace Fox--to pay prosecutor 15s or be imprisoned two months. Paid and discharged. Hugh Goodman--assaulting Robert Halliday--two years imprisonment and hard labour. Hugh McCaffery--picking the pocket of Thos. Trimble-- imprisoned six months. Margaret Fegan--stealing a cashmere gown the property of Eliza Rice--imprisoned thre months. Sarah Nesbit--stealing two pair of worsted stockings-- imprisoned three months. James Megarry--stealing a waistcoat the property of John Peacook (?) --imprisoned six months. Mary Mathews--stealing five turf--imprisoned one month from date of committal. John Daly--picking the pocket of Richard Young of 2s 6d-- transported seven years. Edward Mackin--stealing a quantity of oats--three months imprisonment. Margaret Young and Bridget Young--stealing turf-- imprisoned one week each. John Irvine, John Collins, and Robert Phelan--assault and riot--fined 6d each. Mary Brown, Anne Brown, and Robert Brown--assault on Wm. Fleming--one fortnight's imprisonment. John Mallon--riot and affray--imprisoned one month. John Muldoon, Arthur Brownlee, James Mulholland, and John Murphy--riot and affray--imprisoned one week. Thomas Bartin and John Brownlee--riot and affray-- imprisoned one fortnight. 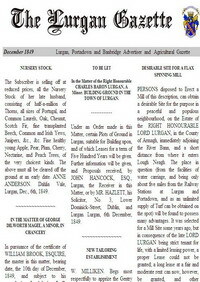 LEINSTER CIRCUIT--The Right Hon. the Lord Chief Justice; the Right Hon. Baron Lefroy. NORTH WEST--The Lord Chief Justice Doherty ; the Hon. Baron Pennefather. NORTH EAST--The Hon. Judge Torrens; the Hon. Judge Crampton. HOME--The Right Hon. the Lord Chief Baron ; the Hon. Judge Burton. CONNAUGHT--The Right Hon. Judge Perrin; the Right Hon. Baron Richards. MUNSTER--The Right Hon. Judge Ball ; the Hon. Judge Jackson. On last Tuesday evening as Mr. Jas Kilpatrick, of Ballylane, was returning home from this city, he was seriously hurt, by the horse on which he rode falling under him. James Digney, Joseph Hughes, Hugh Dunbar, Wm. Woods, Thomas Close, James M'Giveran, James Corran, Patrick Brankin, and John Daly, convicts in the Gaol of this county, were given in charge to Head-Constable Lodge, on Saturday morning, to be transmitted to Dublin for embarkation to Vandieman's Land. The convicts Woods and Dunbar are the same (Lye and Reaney), who made their escape from Downpatrick Gaol in October, 1843.